Ranking the best college football programs is a project that is about as murky and maddening as picking out the classiest Basketball Wife. I'd love to tell you that the list below is based on something a little more scientific than a gut reaction, but that would be stretching the truth. The reality is that I just sat down and moved names around until this list of 10 looked right to me relative to where all these programs stand right now at this very moment. *Is the program in transition? Are NCAA sanctions clouding its future? **How does the rest of the college football world look at the program? One way to think about it is the degree to which other programs are seeking to emulate the way that team operates. ***Is the program trending in the right direction? Having suffered through Oklahoma football in the 1990s, I've witnessed firsthand how major probation can ruin a program. I can't, therefore, put USC or Ohio State – yes, it's coming, Buckeyes – on this list. The closest call to be left off: Florida State. I have a feeling the Seminoles will make the 2012 version. Anyway, let's finish up Best of Week with a bang. Without further adieu, the 10 best college football programs today. Sorry, you two – have to press your noses against the glass ceiling. They're well coached and win a lot of games. Frank Beamer's bunch tipify the rest of the company they keep in the ACC. They're consistently strong, but never the cream of the crop. They are brutally boring. What they lack in pizzazz the Hokies make up for in consistency. Like many of you surely do, I get the impression Auburn's program is sitting on top of a house of cards. Yet, since we don't really know where the Tigers stand with the NCAA, I guess they've got that going for them. Gene Chizik, Trooper Taylor, etc. are smoking on the recruiting trail. Oh, there was also that whole national championship thing last season. With all that money and the pick of the litter in terms of elite Texas talent, the Longhorns don't have as much to show for it as you'd think. UT's 2005 season should go down as one of the best in college football history, and the 'Horns played in another national title game just two years ago. Still, the implosion in 2010 and subsequent housecleaning within the coaching staff have introduced some uncertainty about the future. It's tough to shake the feeling that UT will never be the 800-pound gorilla it should be so long as Mack Brown is in charge. As the Will Muschamp era dawns in Gainesville, I was tempted to slide the Gators down into the bottom half of the top 10. With Jimbo Fisher upping the ante at Florida state, it's only going to be that much harder for the Gators to stay on top in the Sunshine State. You could argue they've already been passed by the Seminoles. Still, that doesn't wipe out the success of this program in the last five seasons or the strength of the Florida brand. UF has lost some momentum, but it remains a top-five program in my mind. A couple national championships under two different coaches in the last 10 years. One of the most talented rosters in the country year in and year out. Playing in the toughest conference in the nation. What's not to like? 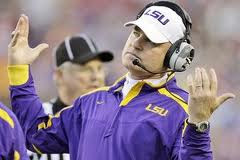 Well, even though Les Miles definitely brings some excitement to the college football world, I can't help but think that his shenanigans cost the Tigers at least one game a year. Despite Oklahoma's near misses at a second national championship for head coach Bob Stoops, the Sooners have owned the Big 12 for more than a decade now. Recent history shows that if you play for OU under Stoops, you will win multiple conferences titles and play for a national championship. The Crimson and Cream is loaded up for another shot at a national title in the fall. At this particular moment in time, 'Bama is the premier college football program. The Tide might have come off desperate as a cougar at closing time in its pursuit of Nick Saban, but you can't argue that losing a little dignity helped dramatically upgrade the football team five years later. Within two years 'Bama went from a middling .500 team to the king of the SEC West. Within three, the Tide had climbed to the top of college football and appear poised to do so again this season. Saban disciples such as Will Muschamp, Derek Dooley and Jimbo Fisher have landed elite jobs in recent years, as competitors seek to copy the new Alabama blueprint.